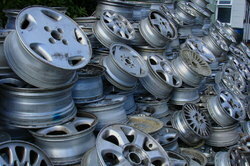 We are the leading Manufacturer, Exporter, Supplier and Importer of Aluminium Wheel Scrap. Enriched with massive industry indulgent and understanding of this sector, we are involved in presenting a wide assortment of Aluminium wheel scrap. These scraps are widely used for the purposes of reusing and recycling. Available with us in bulk orders, our customers can get these from us at affordable costs. Also, we assure delivering these on time. Various types of Aluminum Scraps are offered by us such as tense, taint tabor, extrusion, wires and wheel. For recycling process, these scraps are used. Aluminum is light weight compared to steel and contains excellent corrosion resistant properties. Our scraps can be availed from us in required quantity. These are used to prepare various types of aluminum products. We have availabe in stock the following scrap. 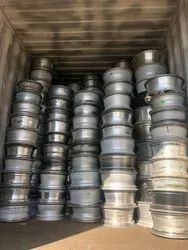 We are dealing in Aluminium Wheel Scrap. Being one of the renowned firms in the industry, we are decidedly involved in providing a high-quality array of Aluminium Wheel Scrap. With our expertise and trustworthiness, we are engaged in offering an optimum quality range of Aluminium Truck Wheel Scraps. We want to sale grinding wheel scrap.